Whilst Sei Shonagon’s Pillow Book confined its observations to life at a Japanese Court a thousand years ago, the books produced in Europe in the Middle Ages, though owned by a few, illuminated the whole of society. Some of the most beautiful and valuable books in Britain were inaccessible to the majority of people in the society which produced them, and subsequent direct access to mediaeval books has been difficult, except for scholars. These illuminated books were unique, one-off works: literate in a long period (six centuries) of general illiteracy; written by scribes; illustrated by painters; embellished by illuminators; hand-bound by craftsmen and owned by an elite – the church or the monarch. Paradoxically, their elitist status has guarded their survival for later generations and more general – though restrained – perusal: in museums, private collections, libraries, TV and online. We are these days all familiar with the meticulous Gothic writing, the illuminated letters (miniature worlds in themselves), the use of gold leaf, the intricate patterns and the bright jewel colours of these scenes from England’s past. Images of the scribes responsible, with their quill pens, tall desks and candles, are ubiquitous and some even revealed their feelings with comments such as, “Thank God that’s finished!” These artefacts from an age of faith present the drama of the grand biblical narratives: the expulsion from the Garden of Eden, where lurks the serpent; tiny David seeing off big Goliath; the Annunciation starring the Angel Gabriel; bad boy Judas and his pile of money, as well as scenes from contemporary life. But they reflect also the power struggles of the age. At a time when mediaeval kings were seeking to consolidate their position, we have on the one hand the self-help books for good kingship, and on the other hand scenarios promoting monarchic power. We find ourselves at court with everyone listening to the king being wise, or being an arbiter of refined taste with his tapestries and fine plate, or a scholar-king reading a book in which he appears on every page. Then there are the instruments of power-keeping: Excalibur, castles, war horses, shields with bright, bold coats of arms, the earliest cannon, Lancastrian roses, red dragons, portcullises, parallel rows of vertical and horizontal spears, Yorkist roses, soldiers in gleaming armour, streaming banners, boiling oil, mechanical weapons of mass destruction, the cross of St George, rows of valiant archers, trees of auspicious lineages, and curious castellated ships. Then the fruits of living in a well-governed, secure land: scenes of hunting with faithful dogs, knot gardens of herbs, lawns of spring flowers, dancing maidens, exotic birds, interiors with people eating and conversing, farmers drinking in taverns, nuns having moments of religious ecstasy, young men playing musical instruments, a lone figure gazing through a window to the beginnings of landscape art, with the equal expectation of seeing angels, devils, monsters or shooting stars. This precious insight into the religious, political and cultural life of a feudal society, so beautifully and skilfully presented, is what we aficionados of the era would regard as priceless treasure, but mediaeval books and manuscripts were literal treasure at the time and remain so. Edward IV commissioned a book about Julius Caesar which cost the equivalent of hundreds of thousands of pounds. The vellum on which such works were written took three months to prepare and the labour-intensive nature of the processes of writing, painting, embellishing and binding alone – not to mention the candle bill – was enough to make the book expensive. But it was the amount of gilding that qualified it as treasure. King Edgar the Peaceful’s Royal Charter (now in the British Library) was created by the monks at Winchester and has every page written in gold. During the 1420s, books captured from the French royal family by the English conquerors were sent by boat to England as war booty, because they were literally worth their weight in gold and jewels. We have them still and they have survived for the following reasons. For a start, they weren’t placed in public libraries! Very few people: the monarch, the aristocracy, cathedral elders, had access to them and they were kept secure because of their value. Artefacts: plate, armour, statues etc. could be melted down for their metal when times became hard, but the gold in books could not be extricated, so they were spared. Because books remain, for the most part, closed, and because these particular books would also be stored in secure boxes, and sparingly touched, then damage from dust and sunlight and handling was minimised. No – the greatest threat to their survival came during the dissolution of the monasteries. Of which, more later. The BBC’s recent short series: Illuminations, written and presented by Dr. Janina Ramirez, gave viewers the opportunity to see mediaeval books not readily available to the public, whilst examining, through them, the changing balance of power between church and monarchy, between the monarchy and the nobility and between rival claims to succession. Mediaeval books were the precursors to Ancestry.com. After 1066, William the Conqueror needed to establish himself in England, and in an age of illiteracy, a book had almost shamanic authority. The Genealogical Chronicle shows William’s countless connections to the throne of England, whereas the hapless Harold Hardrada is shown isolated and having none. When, aged 14, Edward III succeeded to the throne, he was in a precarious position, caused by his mother’s lover, Mortimer and an unruly bunch of nobles. He established his power by executing Mortimer, by appropriating the legendary King Arthur as head of his lineage, and bringing the thuggish nobles into line by making them knights of his own version of the Round Table: a powerful recurrent motif in mediaeval books. This was a wise move: he flattered them by associating them with a mythical dynasty; he gave them a common focus and he kept them at court where he could keep an eye on them. In the meantime he concentrated on establishing a claim to the French throne: something else that would consolidate his power in England. Edward III was a strong King who used every trick in the book of power to retain and sustain his sovereignty. The same could not be said about Henry VI, who was pretty useless. 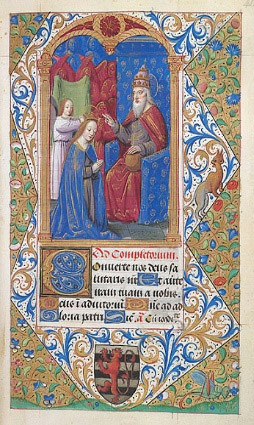 The Shrewsbury Book presented Henry’s right to the French throne. The common ancestor for both English and French lines was shown to be St Louis of France. However, this claim was no match for Jean d’Arc: single-pointedly reclaiming Normandy and Gascony. Power doesn’t only hinge on the propaganda machine that puts St Louis on your side, but on the intelligence, strength and personality of the king, and his ability to control opposition. “I am called the Tumbledown King and all the world mocks me,” poor Edward II wrote in Peter Langtoft’s History of Monarchs. Plenty of advice on kingliness was available for hopeless kings like Henry VI and Edward II. 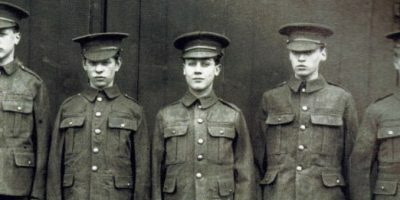 The Regiment of Princes was written for Henry V in English, to stress his Englishness, since all four grandparents were English born. Chaucer, “the first finder of our fair language,” also makes an appearance. The handbook must have worked: Henry’s success at the Battle of Agincourt led to the English occupation of half of France. But everyone knows it was really Lawrence Olivier. Dr Ramirez also demonstrates the manner in which, over the centuries of the hand written book, the image of the monarch changes, assuming greater importance. The earliest books were produced in the monasteries for the glorification of God and they had a public life: placed on altars, accessible to those who were part of the monastery’s ritual of instruction and worship. The king’s power came from the church too, so he had to keep it onside by donating money to monasteries and espousing piety, even if his day job involved brutality and womanising. One of the earliest works: a Gospel Book inscribed to King Athelstan, makes a reference to kingship, linking the divine with the temporal. A portrait of Athelstan, holding a book, adds biblical scholarship and knowledge to the warrior image, softening it. By sponsoring monasteries, where all the books were originally produced, any king could get propaganda for his cause by being painted in as the biggest figure in a holy scene or two, and having his name in lights next to Christ. By the time we get to the rule of Henry VIII, the power of the monarchy has superseded the church, overturned the Catholic tradition, dissolved the monasteries and changed England fundamentally. Henry’s new Psalter, with his own hand-written comments of convinced rectitude, portrays him as having surpassed King David – the ultimate role model of strong, wise ruler – as the superstar king, his despotic self-promotion complete. This was King Henry VIII as public figure. Dr. Ramirez also gives us a glimpse of a private moment in his life, involving Anne Boleyn. In a prayer book used by the royal household Henry has written in French, next to an image of the Man of Sorrows (from Isaiah): “If you remember me in your prayers as strongly as I adore you I shall hardly be forgotten, for I am yours”. Anne replies: “Be daily proof you shall me find to be to you both loving and kind”. More significant than what she writes is her choice of image: the Annunciation. By referring to the Virgin Mary’s pregnancy, Anne is offering Henry the male heir wife number one failed to produce. So this is a private moment of people exchanging notes in church: the calm intimate time before the international storm which was about to break England’s connection with Rome, so that Henry could divorce Catherine and marry Anne. At this point it is a good idea to pause and consider how strong the traditional Catholic faith was in England at the time of Henry’s dalliance with Anne. Although the gold-laden books were exclusive to the aristocracy there was a genre also available to the less well off: the Book of Hours that some people in the ascendant middle classes could afford, ranging in quality from minimal use of an illustrated first letter, to full-page miniatures and jewelled covers. They were made for lay people who wished to incorporate some of the monastic devotions into their daily life. Certain prayers were associated with certain times of the day, hence the title. Usually associated with women, Books of Hours qualify as being private, though not secret. The book was not hidden away – far from it! As an expensive status symbol it might be shown off, like a new hat, even if it was second-hand, with the original heraldry painted over and the names altered, to cut costs. But within the commonality of Catholicism which gave rise to these books, private individual qualities could be incorporated: favourite saints, relevant prayers, local customs, family portraits painted into religious scenes, coats of arms, the names of children, autographs of visitors, and an alphabet for teaching children to read. Husbands would give these devotional books to their brides and, being the sole book in the household, it had to multi-task and would be passed down through the family. It had monetary value; it was part of the family’s religious and social life and status and it originated from the Catholic monastic tradition, so when Henry fell out with the Pope and started to mislay his wives, this had a personal impact on everyone. For a start, the contents of the Books of Hours suddenly became heretical in the now Protestant society. Rather than discard them, people would erase or cover anything that could be construed as Papist. Nevertheless, many Catholic artefacts were destroyed during the period of iconoclasm that accompanied the dissolution of the monasteries. Books of Hours could claim to be private because they were bespoke and further customised by their owner, but not inviolate in that Henry VIII could control the contents. It was no longer the church that prescribed religious faith and practice, but the state. Caxton introduced printing in 1476 but the big money was still, for a time, on the hand-produced books, rendered more desirable in an age where mass production was becoming possible. But printing did revolutionise things: books became affordable and accessible and so did ideas. As soon as the English translation of the Bible became legally available (rather than heretically secret) the obscurantism of Latin and the elitism of the Catholic Church could be challenged. This was a huge democratic change which emphasised the empowering quality of literacy: of words and ideas open to all. Generally speaking, the pendulum swung away from the concept of a book as an individual luxury artefact for the aggrandizement of the power holders, towards the potency of content and its relevance to everyone. This has culminated in the digital revolution, a period of unrivalled access to everything ever. Instantly. What was once only for the use of the rich and powerful can be seen by everyone, on an omnipresent screen. Within the brash openness of the social networking forum we have inexpensive and indiscriminate communication – the opposite of hierarchical secrecy. But what we have effortlessly, we discard easily, because things can be reversed. If we regret sending Fifty Shades to Age Concern, a traffic-defying Amazon knight can replace it the next day. We don’t even need the physical object; we can have it virtually, at a double-click. It isn’t surprising that we have lost sight of how precious books are. However, as Dr. Janina Ramirez points out at the end of Illuminations: although much of the information can be equalled by the sophisticated technology of today, the unique beauty and exclusivity of the mediaeval manuscripts is another matter entirely. And this is a thread I wish to pursue in part three: Book Art.